This is the first workshop in a series aimed at helping spinners become more knowledgeable, confident and proficient in the art of spinning. It concentrates on hand spinning using the Forward Worsted Draft. 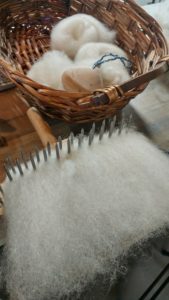 Students will see first hand how fibre preparation, fibre choice and drafting technique affect the characteristics of their finished yarn. With workshop #1 under their belts, students will be given a few spinning assignments to work on over the year. These assignments further cement the skills learned in the first workshop and serve as the foundation for the next workshop in the series, the Backward Worsted Draft. Call 250-542-6243 or drop by the Arts Centre to register. Registration deadline is Monday, August 13th.